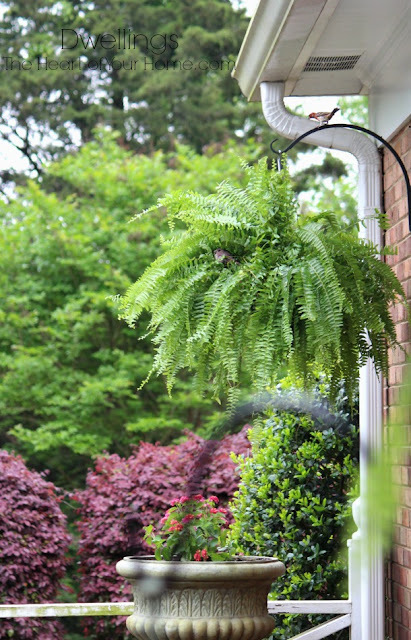 Just after placing the Boston fern on a hook and giving it a spray of water, I headed back in the house. Once in the kitchen I looked out the window and noticed a house finch landing on the fern. She began bathing in the droplets of water; it was the sweetest thing to watch! 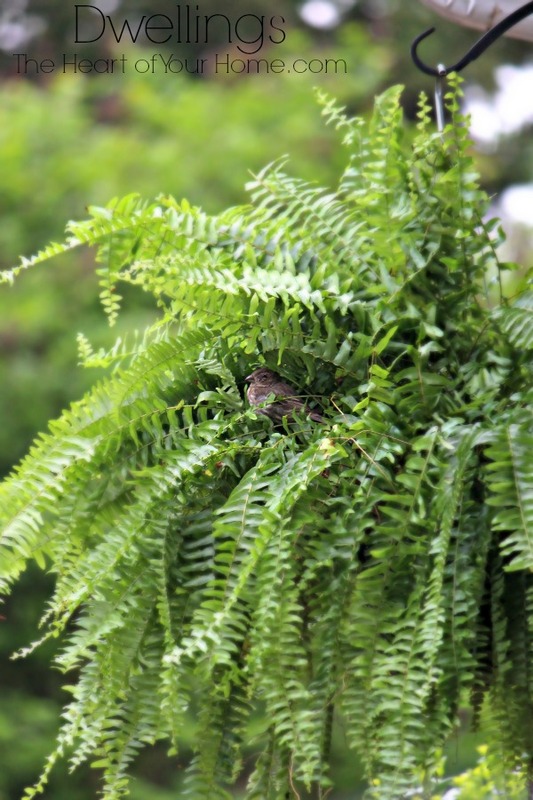 After her bath, she nestled herself into the fern as if to take a nap, so I headed for my camera. A little bath. Settling in for a nap. So sweet. Once back with my camera I took a few pictures of the sleeping finch, which seemed to be all alone. 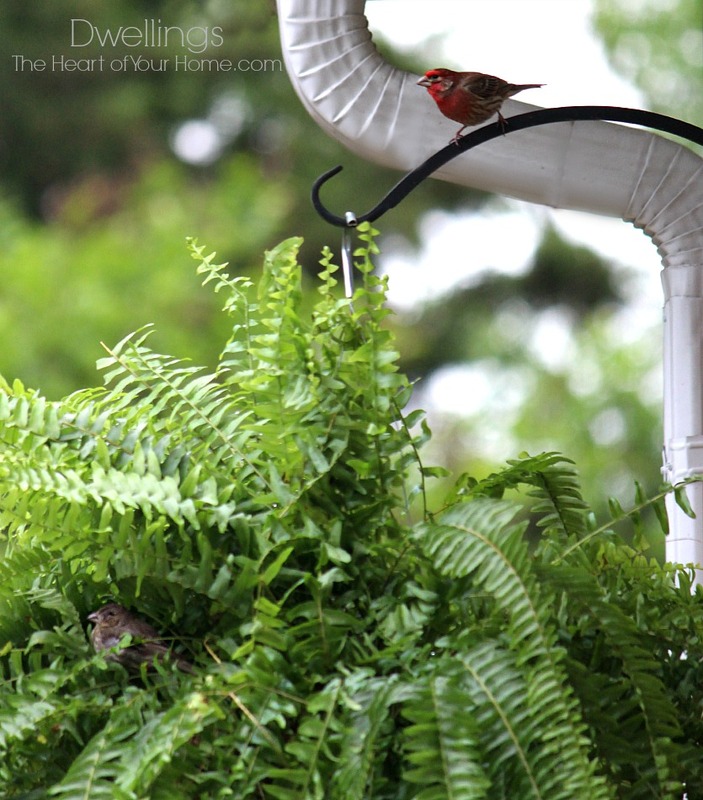 No sooner had she settled in and closed her eyes when a mister came calling, landing on top of the hook. He began peering down at her. Then he would look away. he decides it's time to get a little closer. As he lands beside her, she looks over at him and just as quickly looks away, closing her eyes to continue napping. 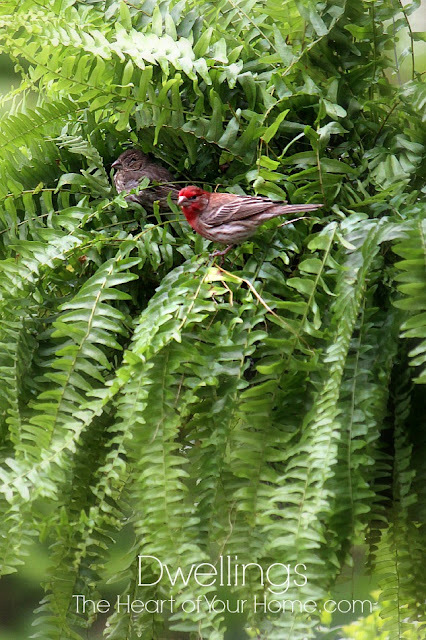 He begins hopping from one fern frond to another; she pays him no mind. Back and forth, up and down, he keeps on hopping. She opens her eyes a bit, still not looking at him. And then she lets him have it! I don't know for sure what she is saying, but she seems serious. 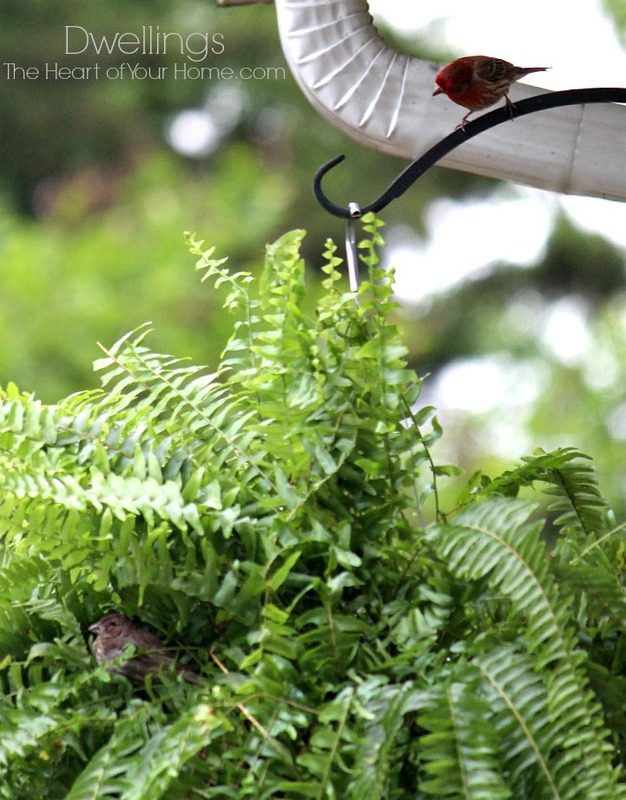 Hopping to fronds further and further away from her until he flies away. A little bird tiff; a petty little quarrel. It wasn't long after that she flew off too, maybe to say I'm sorry? 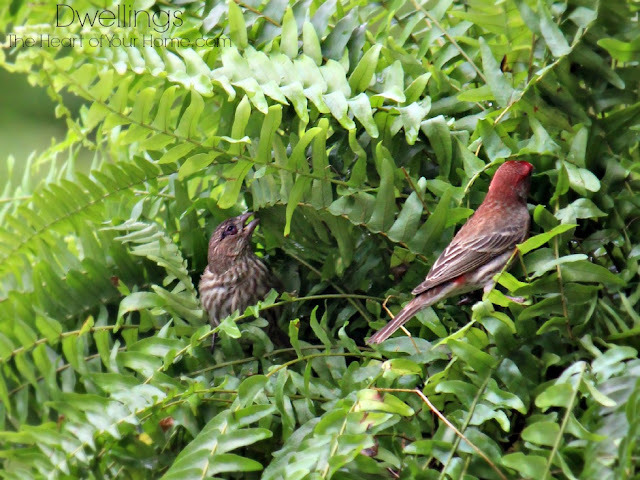 I recently shared Spring Garden and Babies Too, with these two house finches and he was singing the sweetest song to her. Maybe it's the same couple? 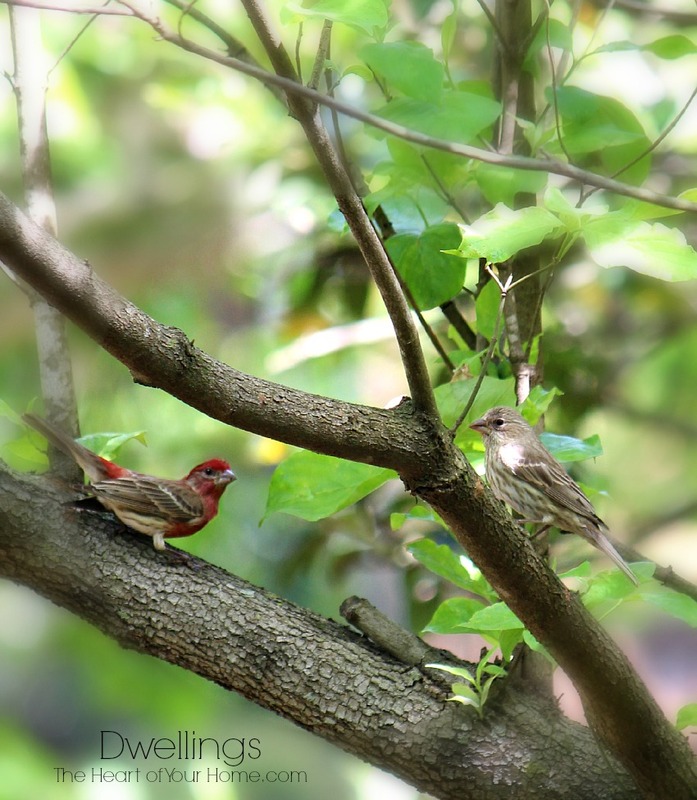 Please feel free to share your nature stories! 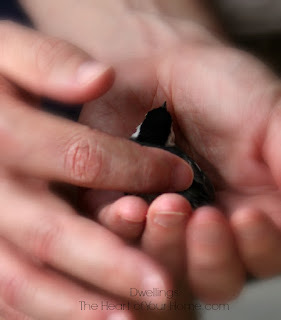 To read about our chickadee rescue go here, When Nature Needs a Helping Hand. Hop over to see this weeks features and tons of inspiration at AMAZE ME MONDAY! Cindy, these are such great photos...and you were certainly able to capture a great story in the making! I do love to watch the birds...and I hope you had a blessed Mother's Day! How precious. You don't get to see them so close very often. Great pics and post. So, so sweet and what fun for you to sit back and observe. Lovely post! Aaashhhhh. So sweet! I get a giggle watching the birds we have in the back garden. 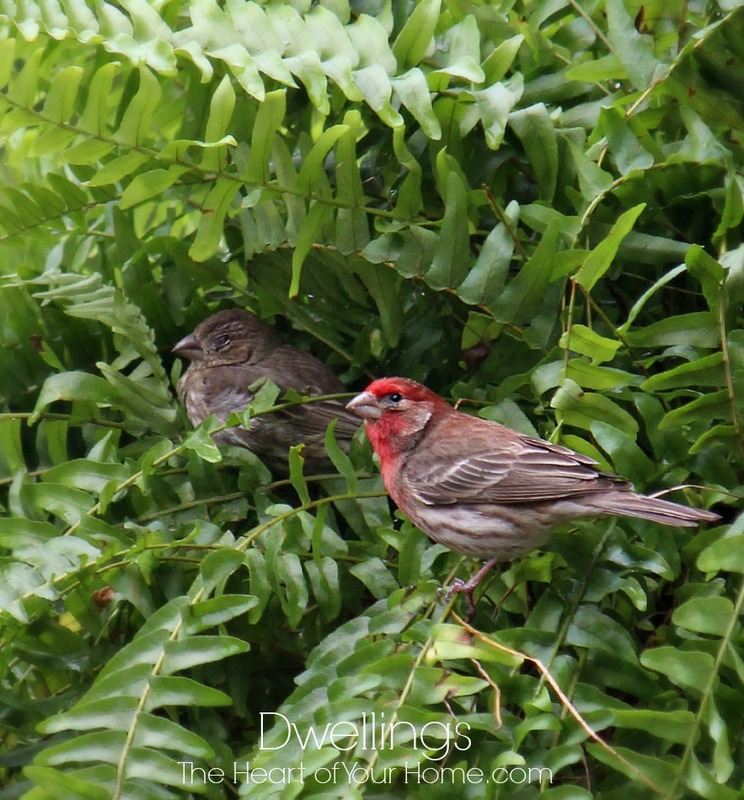 The Finches, only in the Spring, the Chicadees, Tufted Titmice, the Wrens, the blue birds, Mocking birds, Jays and an abundance of Cardinals, a two types of Doves, I constantly fill the feeders and baths. BUT it's totally worth it! 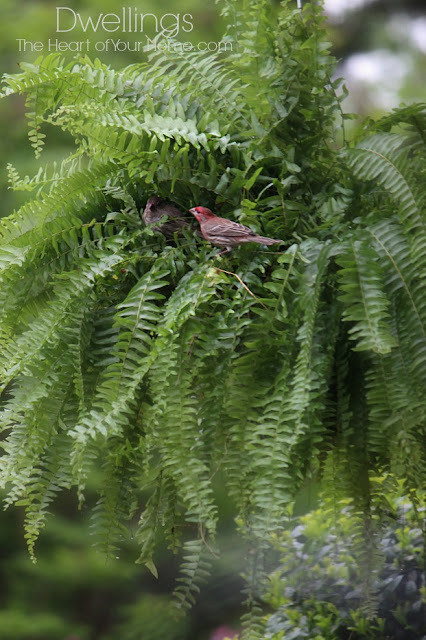 Perhaps she's taking a break from the nesting spot and she's telling him to get back to it. Cool shots, Cindy! What a story, Cindy, and to think you caught in on your camera! I just loved this. You do have lots of sweet little birds at your house. You must feed them well. OMG, just precious! Love the bird pictures Cindy! LOL this was just adorable! 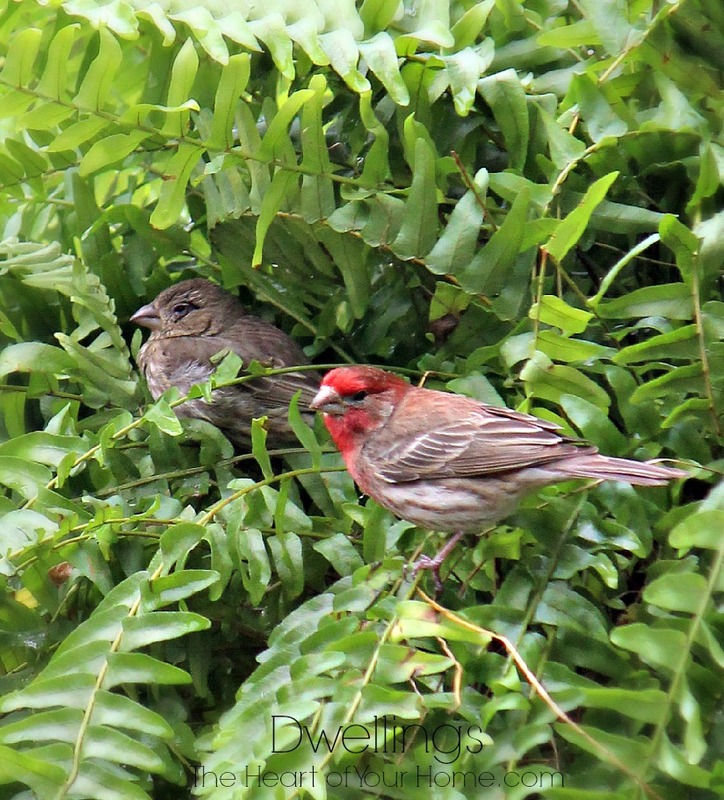 Oh my goodness, what a sweet look at our little feathered friends. Your pics are fantastic, Cindy! Hmmm.....maybe the Mrs. had a bit of a headache, which is why she needed a little "spa" and "nap" time.....heehee! What a cute story Cindy! Thank you for joining Home Sweet Home!